Emotionally damaged by her parents’ divorce, physically and psychologically damaged when she was caught up in the 2002 Bali bombings, and with her father-substitute facing terminal cancer, 32-year-old American adventure guide Jamie has a lot of baggage. Nevertheless she returns to Bali for the ceremony which will mark the first anniversary of the bombings, still grieving for her boyfriend who died there, and yearning to find Gabe, who helped her rescue people and then rescued her. Ever since Eat Pray Love, Bali has entered literary mythology as a place of spiritual healing, a place just sufficiently exotic and mysterious but with enough home comforts to keep a Westerner comfortable (Jamie’s cell has a signal pretty well everywhere on the island, enabling her constantly to phone her mother and dying friend in the US). Ellen Sussman accurately describes the chaos, multi-culturalism, corruption and beauty of the island, but not in a way that comes to life, more as hooks to hang her plot on. But a novel is not a travel guide, or a cultural study. Jamie is on a journey towards healing and adulthood and that is where the true interest of the story lies, or should lie. Instead Sussman reaches for the easy option and writes a conventional romantic novel, selecting from the standard tropes. Jamie is feisty but vulnerable, and come to that so is Gabe – they are both Broken Birds. She is beautiful, despite her facial scar, and he of course is tall with a lock of hair that flops forwards. After the bombing, once her wounds are dressed, he takes her to an idyllic hidden cottage which remains untouched by the chaos everywhere else and their romance begins. But she runs away, back to the US, while he stays on Bali where he has a teaching job. 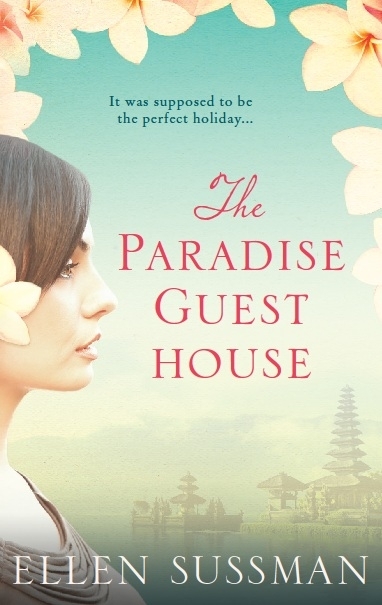 Jamie struggles with her issues, longing to have a close family life such as she sees on Bali, and yet unable to spend more than a few days with her mother and barely in touch with her father. The question at the core of the book is whether Gabe and Jamie can form a relationship built on spending a few days together at a time of intense trauma followed by a year with no contact, but the answer is not explored with any depth or any great level of insight. The ending is heavily signalled from the start, and although there is a twist in the plot towards the end, it never convinces. 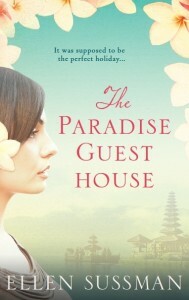 Still The Paradise Guesthouse has a page turning quality. Sussman’s Bali is an interesting place to spend an hour or two, and her characters are moderately engaging. The most interesting of all is Bambang, the 14-year-old street boy who helps Jamie track down Gabe. His story is tragic, his resilience is impressive, but he is only a minor character who feeds into Jamie’s journey without travelling very far himself. So, if you’re having a staycation this year, and would like to escape into an exotic dream world while the summer rain pours down on the caravan roof, you could do worse than take The Paradise Guesthouse along with you.